Is MontBlanc the only luxury writing instrument you know? To a real pen expert the answer is definitely a NO! 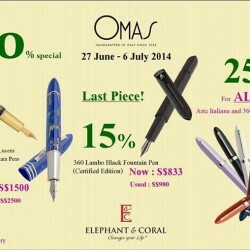 Shop classic OMAS Pen at Elephant & Coral and have your hand on those timeless design in last piece with up to 40% off discount. Elephant & Coral @ Mandarin Gallery #03-03. [Castlery] 10% off Our Latest. Ends Tuesday! [UNIQLO Singapore] Mid Week Pick-Me-Ups! 27 - 28 Apr 2019 Bosch: Exklusiv Sale with Up to 70% OFF Home Appliances! Till 26 Apr 2019 Jewel Coffee: Enjoy 1-for-1 Beverage on Weekdays! 25 - 27 Apr 2019 On The List: Flash Sale with 80% OFF All Items from Y3, Dsquared2, iBlues, Blauer & Weekend Max Mara!